You will never see another October 5th 2003 for the rest of your life. It is gone forever. And since we see the days pass and we have to tear off the month and throw it away – finished forever and a new month – and then somebody sends you a new calendar and then you throw away the whole year of the past. How many calendars have we thrown away in our life? That’s how old we are. So time is passing. But within that calendar, which is like the altar of time, Krishna says, “Time I am.” Yes! Time is Krishna. So the calendar is like the altar of Krishna in his deity of time. But within that altar, Krishna is so kind, he gives special darshans. He actually appears in certain ways on certain days and those are the holidays. I am not speaking about Independence Day or Republic day. I am speaking about Janmashtami, Radhashtami, Govardhan Puja, Sharad Purnima, Dashera, Ram Navami, Gaur Purnima, Varaha Dvadashi and so many appearance days and disappearance days of great acaryas. These days are worshipable because on these days the Lord is actually making himself especially available. They are opportunities where we really put our hectic lives aside and focus on the significance of the deity of that day: Krishna, his pastimes, his devotees. And in doing so he is giving us the opportunity to remember him, to contemplate his mercy when he descends into this world. And especially to hear his glories in the association of devotees and to chant his holy names. 23 Responses to "The Calendar is warning us"
Holidays, not as Independence Day or Republic day… but Janmashtami, Radhashtami,Govardhan Puja, Sharad Purnima, Dashera, Ram Navami, Gaur Purnima, Varaha Dvadashi and so many appearance days and disappearance days of great acaryas. Yes, we need to understand that which are the real holy days and maximize our spiritual advancement on these days. Very Profound.. Swamiji has given a new way to view the calendar and also to learn a very important lessons from it. Thank you for posting. Yes that is true. We are going to be older and older but with special mercy of the Lord on his appearance day atleast we can spare our time to celebrate and hear his glories. If we look in deep and think for purpose of life probably all scripture suggest to serve the Lord and become devotee of the Lord. But still material desires are so strong that we could not realize recommendations of scripture and continue our materialistic life. But such special day just reminds us and provides us an opportunity to revive our consciousness. I like this talk very much and it touches my heart and force me to think for purpose of my life and time I may have to achieve it…Let us think.. Very nice article and very timely wake up call by Radhanath Swami. superb ! 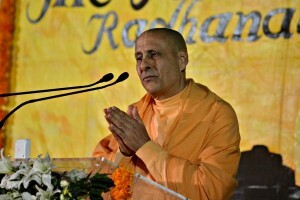 Radhanath Swami Maharaj has made all the provisions what Rupa Goswami explains in Sri Bhaktirasamrita Sindhu. ! 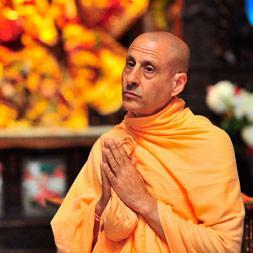 Radhanath Swami’s this article really awakens us from slumber. This is the essence of all the scriptures. Often it is so scary to try to comprehend that how fast the time is passing by and with each passing moment everything material is being destroyed by the power of time. However, for one who is engaged in the cultivation of spiritual goal the same passing time is source of so much hope because wit each passing moment such a person is moving ahead closure to the most cherished goal. Many thanks for sharing this hope giving aspect from teachings of HH Radhanath Swami. Such a wonderful explanation of how we should utilize our time on such auspicious occasion to engage ourselves in devotional activities , get spirtualy charged , get special Darshan of the lord & get mercy of guru & devotees by rendering devotional service. Thank you for sharing !!! Thanks for capturing the essence of the topic. Very rejuvenating article about celebration of festivals. Festivals offers us opportunity to access unlimited mercy of God through beautiful darshans, melodious kirtans, charanamruta, delicious prasadam and much more. Festivals increases our ethusiasm to render more services. Thank you very much H.H. Radhanath Swami Maharaj for wonderful explaining significance of festivals in calender of our life. Very nice article. The importance of celebrating festivals is so wonderfully explained by Maharaj! what a statement “So the calendar is like the altar of Krishna in his deity of time”, I never looked at a calendar in this spirit. 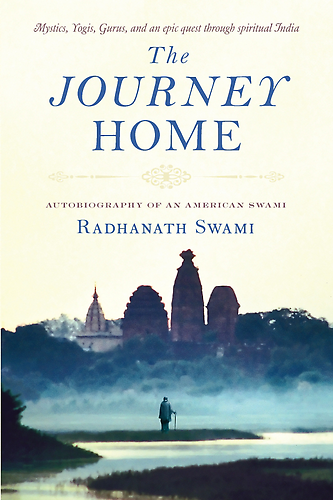 Thanks HH Radhanath Swami for a very different and sublime perspective. Yes, this stroked to me as well very deeply. What a way to look at calendar!!! Thanks Radhanath Swami. Superb narration about the significance of celebrating festivals to gain the mercy of the Lord and his devotees. Thank you for showing us how important it is to celebrate appearance and disappearance days in the temple or at home.